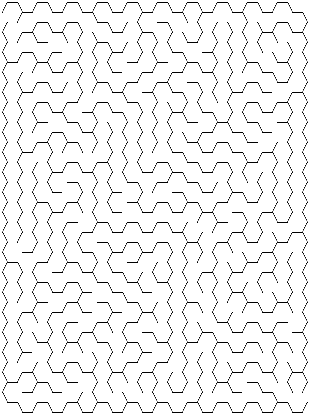 I’ve said before that generating mazes is a great default project when experimenting with a new programming language. I’ve yet to find a better one (but I’d love to hear recommendations). 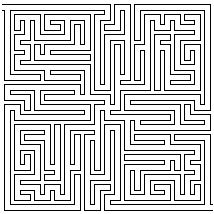 However, before you can dive into generating a maze (especially in a syntax you are unfamiliar with), you had better have a solid grasp of how the process works. 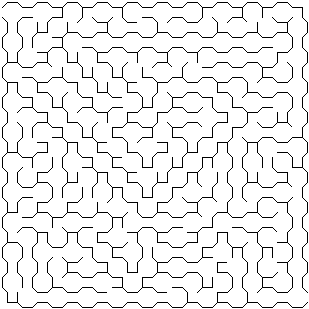 With mazes, you can take your pick of a solid double-handful of algorithms: recursive backtracking, Prim’s, Kruskal’s, Eller’s, Aldous-Broder or Wilson’s algorithms, recursive division, hunt-and-kill, and more. My favorite, and the one I implement by default, is recursive backtracking. It is fast, easy to understand, and straightforward to implement. You’ll need sufficient memory to store the entire maze in memory, though, and it requires stack space again proportional to the size of the maze, so for exceptionally large mazes it can be fairly inefficient. But for most mazes, it works a charm. Choose a starting point in the field. Randomly choose a wall at that point and carve a passage through to the adjacent cell, but only if the adjacent cell has not been visited yet. This becomes the new current cell. If all adjacent cells have been visited, back up to the last cell that has uncarved walls and repeat. The algorithm ends when the process has backed all the way up to the starting point. I generally implement the field as a grid of bitfields (where the bits in each cell describe which direction passages have been carved). That’s probably just the C programmer in me asserting dominance, though; feel free to experiment with other representations. This begins carving passages in the grid, starting at the upper-left corner, (0,0). And as you might have guessed from the algorithm’s name, this works recursively, as we’ll see next. We sort the list in random order, so that the path will meander, rather than having a bias in any particular direction. Then, the function iterates over each of those directions, determining the coordinates of the cell in that direction and deciding if the cell is valid or not. 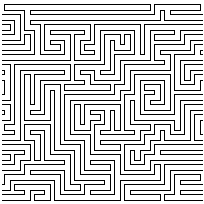 Note that a cell is valid only if it lies within the bounds of the maze, AND it has not previously been visited: we only want to carve passages into untouched cells, to avoid creating circular loops in the maze. Start by writing your own implementation in a language you’re comfortable in, just to wrap your mind around the algorithm. Try replacing the recursion with iteration (always a fun exercise). 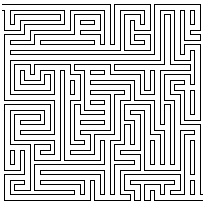 Consider extending it to include weave mazes (where passages move over or under other passages), or braided mazes (mazes where deadends are removed to create loops in the maze), or symmetrical mazes, or wrapped mazes. Or even different cell tesselations. If you’re at all like me, you may find that your “toy” project has taken on a life of its own, and you’re suddenly researching new and exciting ways to build mazes! Once you understand the algorithm, though, the real fun is trying it in a language you’re unfamiliar with. It’ll show you conditionals, bit manipulation (if you use the bitfield storage like I showed above), iteration, recursion, and console output (if you decide to render your maze, too). When you’ve finished, you’ll have a good idea of how the language looks and works in practice, and not just for trivial “hello world” apps. Give it a try! Please share your implementations in the comments (links to gist.github.com are preferred). Actually, once you understand this algorithm, I think the best place to go next would be to change it to a breadth-first traversal. 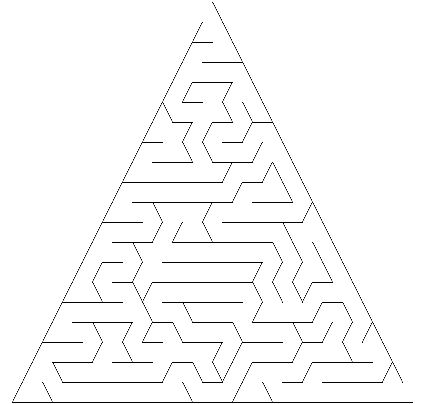 The intuition here is that a maze is an undirected graph, and this algorithm constructs the maze by traversing that graph in depth-first order. This is dandy, but as Jamis noted, it requires stack size proportional to the size of the maze (in the worst case). Actually, it would be more precise to say that it require stack size proportional to the longest acyclic path through the maze, which is (in the worst case) the entire maze, but in the average case will be much much less. Anyway, the motivation for breadth-first traversal is that you no longer have to maintain the longest acyclic path, you simply maintain a queue of unvisited cells. The worst-case complexity is a lot better here, seeing as it can’t be the entire maze (actually, I believe it’s closer to logarithmic in the size of the maze). The average case is also nicer, since a breadth-first traversal drops cells which have been completely visited, requiring a lot less memory. @Daniel, good suggestion! I’m actually going to write up a description of Eller’s algorithm next, which is a very clever way of doing just such a breadth-first traversal. It only requires that memory proportional to a single row of the maze be kept in memory, making it ideal for tight memory conditions. As I said, though, it’s “clever”, so it’s harder to understand and implement than the recursive backtracker, but still a lot of fun. 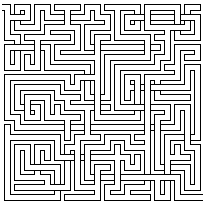 Which of the maze algorithms is the one where you start with a set for each cell, then randomly pick two rooms to join from different sets, then merge their sets, and once you only have one set, you know you can get to any place from any other place in the maze? Done! For the curious, here’s an implementation of Kruskal’s algorithm: https://gist.github.com/756896. It works as will described, placing each cell into its own set, then iteratively joining adjacent disjunct sets until only one set remains. I think I still prefer recursive backtracking for simplicity and the esthetics of the result, but Kruskal’s is definitely an intriguing approach. I’ll do a post about it later, to go into it in more depth. I don’t understand where steps 3 and 4 come in then. Which part of your code does the backtracking to the previous cell with unvisited adjacent cells? It looks like the code will just terminate when it reaches a cell that has no more valid adjacent cells instead of backing up. @Isaac, remember that the carve_passages_from method is called recursively; thus, when the method terminates, the program continues from where that method was last called, which may be within the method itself! Picture it this way: carve_passages_from is called with a a location of (1,1). That invocation of carve_passages_from chooses a direction and then calls carve_passages_from AGAIN with a new location of (1,2). If that newest invocation of carve_passages_from cannot find a valid cell to move into, it will terminate, and return to the invocation of carve_passages_from at (1,1), which allows that loop to continue looking at adjacent cells (possibly choosing the neighbor at, say, (1,0), and calling carve_passages_from on that cell). Does that make sense? If you’d like to see an implementation that uses iteration instead of recursion, I’ve got one here: https://gist.github.com/754545—it uses an explicit stack, which makes the backtracking more obvious. Thanks for the help. I tried to implement some of these algorithms myself a while back, but I got bogged down in the data structure implementation for each of them (sometimes the mathematical descriptions in algorithms textbooks are a little too abstract for me) and gave up. This has inspired me to have another go! @Isaac, that’s awesome! Please do have another go, and let me know how it turns out. Most of these algorithms are actually pretty straightforward once you wrap your mind around them; if you have any further questions, feel free to ask! Hey there, Jamis. I saw your post a few weeks ago (on reddit) and I figured I could try your approach on learning a new language with mazes. @Alexandre, thanks for sharing what you’ve created! I love seeing these algorithms in other languages, as well as seeing how others approach the implementation. Yeah, and thanks for this blog post: I had a hell of a fun implementing this: first in Guile with Postscript for graphics, then in Racket. So, I was looking through your code again. :-) How exactly does your display code work? In particular, why do you do the checks for the adjacent cell and for east and south? Things like this, for example, seem unintuitive: print((gridy & S != 0) ? ” ” : ”_”) – here you are printing nothing when it has something (south) – I would have expected the reverse. Why wouldn’t something naïve like ‘if has_south: print ; if has_north: print ; etc’ work? @Isaac, it sounds like you’re reversing the meaning of the direction bits; if S is set, it means there is a passage to the south, not a wall, which is why the display routine prints a space instead of an underscore when that bit is set. Good question about why I’m only printing south and east! The reason is that I begin by printing the top border, which gives me the initial north wall. Then each row begins by printing the initial west wall. So, when I display the cell at 0,0, I’ve already got the N and W walls, and I only have to emit the S and E walls. Moving to 1,0, I’ve already got the W wall (from 0,0), so I only need to print S and E, again. In general, by printing the S and E walls at x,y, I’ve also printed the N wall for x,y+1, and the W wall for x+1,y. I’ll admit the display routines in my sample code are warts; they were optimized for brevity, because I didn’t want them to detract from the algorithm itself. Once I finish writing about these algorithms (three more to go!) I’d like to cover topics like displaying mazes, etc. Great advice, I learned a few things about Groovy along the way. I ported your code instead of rewriting from scratch so I could spend more effort thinking about how things are done in Groovy. @Ken, thanks for sharing! I’m glad the exercise showed you more about Groovy; that (learning about a new programming language) was my ultimate goal with these articles, after all! Ah, I was in the same boat as @Isacc: I thought the direction bits indicated walls. It wasn’t until comment #14 that it made sense to me.